In November, steel stocks fell on over-expansion fears. One Steel CEO has been fielding these fears for a while and dismissing them. Here's why. On Nov. 17, Steel Dynamics Inc. announced that it was building a large new mill scheduled to come online in 2020. The company's shares tanked nearly 9% on the news and have been heading lower ever since. The entire steel group has been heading lower with it. But Nucor Corporation (NYSE:NUE), one of the largest players in the U.S. steel market, has been talking up expansion efforts for a while and downplaying concerns about over-expansion. Here's why Nucor isn't worried about its growth plans. Nucor's history is one backed by growth. A primary goal is to invest in both good times and bad so that financial results hit higher highs in the good times and higher lows in the bad times. Essentially, Nucor is always trying to find new ways to expand its business. 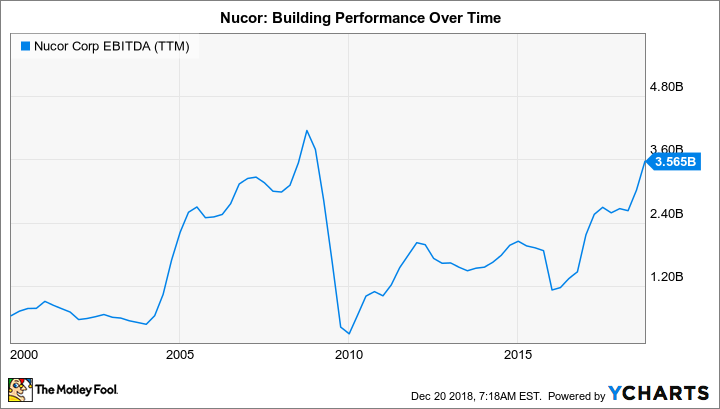 The most recent downturn, which started after the deep 2007-2009 recession and lasted until 2016 or so, was a very active time for Nucor. In a weak market, it focused a lot on acquisitions, including building a new division in the tubular steel space. Notably, that move allowed it to materially increase the amount of its own commodity steel that it could turn into higher-margin products. The percentage of internally used steel has increased from 8% in 2006 to 19% in 2017, with a three percentage point increase between 2016 and 2017. With the steel industry experiencing an upturn, though, there aren't as many value-priced acquisition candidates around. So, Nucor has stepped back a little from buying assets (it hasn't stopped completely, but it also isn't willing to overspend). Instead, management has laid out plans for ground-up construction and plant expansions. It has nearly $2.2 billion worth of growth spending lined up through 2021 spread across nine projects. We don't add capacity simply to add capacity. We're investing in our company to better serve our customers, to strengthen our competitive position, and then frankly to reinvest and position our divisions for the next decade. So, all of our expansion plans are being made with very, very specific strategic objectives. Ferriola didn't stop there, of course; he went into some detail about what was being built and why. For example, part of Nucor's plans call for reinforcement bar mills in Missouri and Florida. The regions in which it is building currently import rebar from other areas, which increases costs for the buyer. By placing mills directly in those regions, Nucor will have a cost advantage and be able to take share from competitors. Further, Nucor's scrap business has a material presence in these markets, so the company will have an ample supply of a key input. The ultimate goal is to be the low-cost producer in each region, with the CEO noting that the way to survive in an oversupplied market "is to be the low-cost producer." Another example of the company's plans is its midwest Gallatin plant, where it is putting in a new hot band galvanizing line in early 2019 and expanding its hot band capacity in 2021. The first project will mean Nucor owns the widest hot rolled galvanizing line in North America. That gives the steel giant a chance to expand into new, higher-margin automotive segments that it couldn't address before. The second project will nearly double its hot band capacity at the plant, but that will support the company's efforts to expand into new, higher-margin market niches, including auto, energy pipe & tube, agriculture, and heavy equipment. NUE EBITDA (TTM) data by YCharts. Although these are just a few examples, every investment Nucor is making is underpinned by similar logic. The big goals are to lower costs, improve offerings, and reach into new markets. And, while it's doing this, it is also rationalizing production. For example, adding capacity in one plant can free up capacity at another that can be put to better use. Or, conversely, there may be excess capacity at a plant that can be put to work in a new way to increase utilization (higher utilization generally leads to lower per unit operating costs for a mill). There's no question that Nucor is expanding its business. But frankly, the steel giant is always expanding its business -- in both good markets and bad ones. The real issue is how it is expanding and why. The process today, as it has been historically, is deliberate and strategically motivated, and the end goal is always to hit at least one of several key targets: lower operating costs, enhance or create a leading market position, move products up the value chain, and expand into new market niches. As long as Nucor keeps hitting those targets, it will support the company's long-term position as an industry leader and reward investors along the way: The company expects to post record earnings in 2018. The steel sector will wax and wane, but Nucor has proven its ability to navigate the ups and downs and continue to grow over time. If you are looking to buy a steel stock today, Nucor should be on your short list. That said, although the recent price drop on overcapacity concerns has made Nucor shares cheaper, long-term investors should probably wait for the next full industry downturn. At that point, you'll likely be able to get a fire-sale price on this industry-leading name.